Every tooth consists of three different layers. The outermost and hardest layer is enamel, and the second layer is dentin. 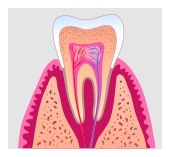 The third is pulp, which is the cavernous space where the live tissue and nerve of each tooth is located. If for any reason the pulp space is exposed to the outside, the tissue becomes contaminated and eventually infected. The exposure of pulp happens in many circumstances, such as when you have a large cavity or a fractured tooth. Your dentist can explain the exact reason for damage to this tissue. In these cases, the treatment is usually root canal treatment. Root canal treatment is the process of going inside the pulp space and removing the infected, dead tissue. The space is then disinfected and sealed with special materials. Nowadays, root canal treatments are performed with advanced techniques and materials, making them far more comfortable and faster. After root canal treatment is complete, your restorative dentist will usually place a crown on your tooth to safeguard against fracture. If you have any questions about root canal treatments and you live in Fremont or surrounding area, give us a call today!